RB Tarik Cohen vs. LB A.J. Klein – No running back in the NFL has forced more missed tackles after the catch than Cohen this season, although not all of them have come out of the backfield. Last week against the Panthers, all seven of Cohen’s snaps came at a receiver position, and 15 of his 33 targets this season have come out wide or in the slot. Klein has been targeted 27 times in coverage this season, and 12 of them have come against running backs, and he has allowed 10 catches for 62 yards with one pass dropped. He’s also missed three tackles in coverage this season, tied for the most on the Saints defense. TE Zach Miller vs. S Kenny Vaccaro – Vaccaro has also missed three tackles in coverage this season, and he’s the lowest-graded safety in the NFL through seven weeks at 38.1 overall. He’s lined up all over the secondary in New Orleans, with 60.8 percent of his snaps coming in the slot with another 22.7 percent in the box. That could pair him up with Miller, who’s run 65.7 percent of his routes from the slot this season. He’s the Bears’ highest-graded receiver this season and the 11th-highest graded tight end at 77.1 overall. He’s the Bears’ most targeted receiver (12) since Mitchell Trubisky became starter. 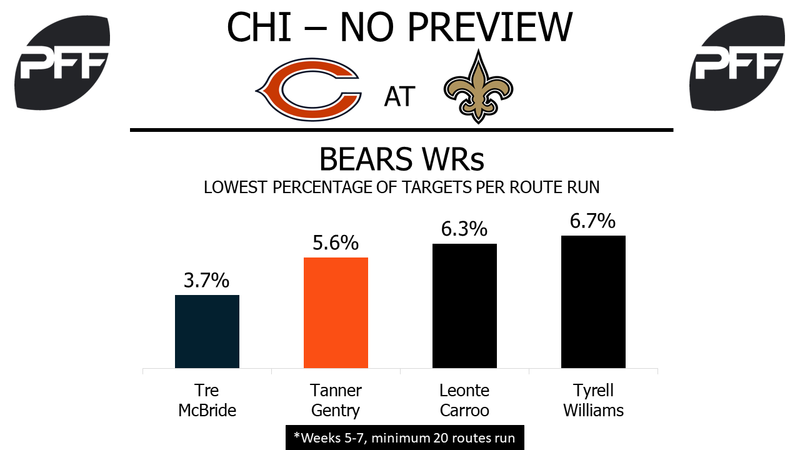 WR Tre McBride vs. CB Ken Crawley – No Bears receiver has played more snaps than McBride in the last three weeks (108), but he’s only been targeted one time, catching it for 18 yards. He’s been targeted on 3.7 percent of his routes run over that span, the lowest among all NFL wide receivers with at least 20 routes run. McBride has had two targets and one catch that were nullified by penalties in Week 5. Crawley was the highest-graded cornerback through the first four weeks of the season, but he’s dropped down to 36th at his position at 80.6 overall. He’s missed four tackles in the last two games, allowing a passer rating of 117.5 since the Saints’ bye week. 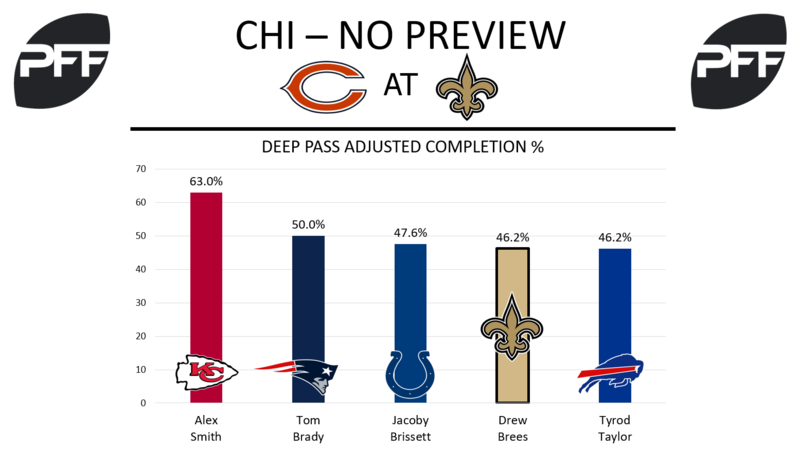 QB Drew Brees vs. S Adrian Amos – Drew Brees has long been one of the best deep ball throwers in the game. On the year, he has a 46.2 percent adjusted completion percentage on deep throws (passes 20-plus yards downfield), ranking fourth out of all quarterbacks. On such passes, Brees has thrown for 385 yards, two touchdowns and two interceptions. As the last line of defense for the Bears, safety Adrian Amos will eventually have to defend a deep ball or two from Brees. Amos is allowing just 0.27 yards per cover snap, tied for 14th among 82 safeties with at least 75 cover snaps. Of Amos’ 14 targets in coverage, he has allowed 11 receptions for 44 yards, no touchdowns and one interception. RB Mark Ingram vs. DI’s Akiem Hicks and Mitch Unrein – Mark Ingram may have a hard time running against the Bears’ interior, as he has only forced four tackles on 89 run attempts and averages a so-so 2.69 yards after contact per attempt. Taking those two factors into account, Ingram has third-lowest elusive rating among running backs (14.3). Meanwhile, in the Bears’ defensive interior, Akiem Hicks and Mitch Unrein have been wreaking havoc all year long. Hicks has a 12.5 run-stop percentage and Unrein has an 11.4 run-stop percentage, ranking fourth and sixth among 3-4 defensive ends. WR Michael Thomas vs. CB Prince Amukamara – Michael Thomas has had to take a big step forward after the departure of Cooks, and he has done a solid job. Thomas has gained an average of 1.91 yards per route run on the year (211 routes, 403 yards), ranking 17th out of 83 wide receivers. His opponent will often be Amukamara, who is allowing an average of just 0.58 yards per cover snap, ranking ninth out of 111 cornerbacks. For both Thomas and Amukamara, over 20 percent of their targets have come on hitch routes, leading to a 95.8 passer rating when targeting Thomas and an 88.2 passer rating when targeting Amukamara’s coverage.